Shoes for Dancing: Which ones should I wear? Just when you thought it was the end of your shoe collection as you know it, here’s some news that will make you feel fine: comfortable shoes aren’t a myth. They actually exist! What is the most comfortable women’s shoe? Generally, block or kitten heels are your best bet when it comes to comfortable heels for work or a night on the town. At least when it comes to basic brands. Since we know we can’t live in those alone, we wanted to dig a little deeper to find brands that make comfort as much of a priority as style. What is the most comfortable brand of women’s shoe? Heels can be a pain — literally. But certain brands have set their sights on making heels that are as comfortable as any flats or even sneakers. Usually, that’s because the most comfortable heels feature technology in both the heel and sole. Take Taryn Rose. The comfortable shoe brand is helmed by an orthopedic surgeon by the same name and focuses on every part of the foot, not just the heel. 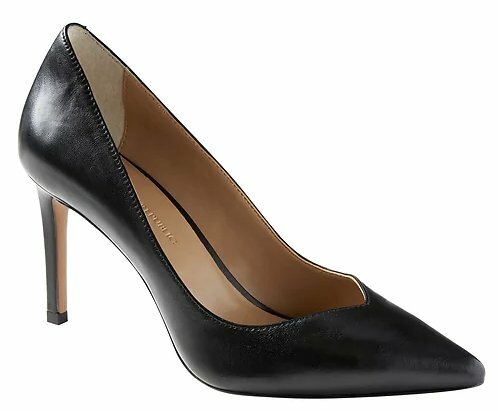 Banana Republic’s Madison line offers 12 hours of comfort thanks to injected insoles for heel stability and comfort pods at the sole. And some of the most comfortable heels rely on specialized technology, frequently created by the brand itself (or in partnership with more athletic comfortable shoe brands like Nike). Cole Haan developed Grand.OS soles, for example, that are lightweight with responsive cushioning and flexibility that mimics the natural movement of your feet. How do you wear high heels without pain? Ideally, you shouldn’t wear your heels 24/7, even if they’re comfortable high heels. Podiatrists recommend kicking them off a couple of times a day to let your toes breathe a bit. Take this free time to stretch your ankles since they often receive the brunt of the stress. When your day is done, do another round of stretches and flexes to keep your feet happy. How do you make shoes comfortable? You do not, in fact, have to trick your nerve endings into submission with the help of sprays. But you may want to pick up some OTC shoe inserts. There are ones that add cushioning from your heel to your toes or silicone gels designed to go under the ball of your foot. The safest bet is to buy a few pairs of comfort- and fashion-forward heels. Here are the brands that make the most comfortable women’s shoes currently on the market.